This image came to my attention while preparing the final manuscript for Volume II of Jesse James Soul Liberty, This Bloody Ground for publication. Conrad Heyer was a contemporary of John M. James. 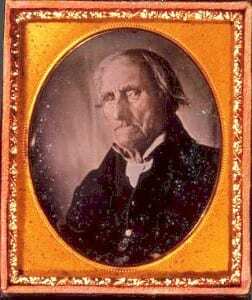 Heyer was 102 years old when this image of him was recorded in 1852. Heyer was a veteran of the American Revolution. He served in all the same locales as did John M. James, Jesse and Frank James’ grandfather, who is my principal subject for Volume II. Together with Joshua Logan Younger, a great-grandfather of the Younger Gang, all three were at Valley Forge with Gen. George Washington. All had been in the Continental Army, serving at the same time. While Younger and James were Southern men, Heyer was from Waldoboro, Maine, where it is said, Heyer was the first white child to be born in that community of German immigrants. The geographic origins of the trio made it unlikely Heyer would have known John M. James or Joshua Logan Younger personally. But his surviving photographic image gives pause to wonder what James and Younger may have looked like, had each lived another generation longer to be photographed. Photo courtesy of the Maine Historical Society.